« Do You Prefer Your Socialism Voluntary, or Mandatory? The Gift Church: Choir Loft, or Orchestra Pit? This is the fourth entry in an on-again, off-again series. Links to the first three are at the end. It’s Holy Week, which seems a good time to re-visit the idea I floated last year of “The Gift Church” — a Christian church that would practice radical generosity on a regular basis by spending more on the needy than it did on itself. This week, as we commemorate the central event around which the entire Christian faith revolves, the question is: how might worship be different at The Gift Church? Then two weeks ago I began to think that the design of most of our contemporary Protestant churches makes it too easy for worship leaders — musicians and singers — to become performers, and thereby too easy for congregations to become passive recipients instead of active worship participants. My first thought as I walked out of the service that morning was that instead of choir lofts, our churches might do better to have orchestra pits. Consider how the choir loft in many Protestant churches differs from the choir in, say, many cathedrals. In cathedrals, the choir area is often built such that the singers face the central aisle with their backs to the outer wall, leaving the area open so the congregation can see all the way to the apse, which often faces the rising sun and presents a beautiful if not inspiring display of stained glass. In contrast, a choir loft, platform, or stage, often backed by nondescript decor, has dominated the front of many of the churches we’ve visited, placing the choir or worship leaders under bright lights and face-to-face with the congregants. But worship is not meant to bring congregants face-to-face with stage-lit people: it’s meant to bring them face-to-face with God. Consider, in contrast, the orchestra pit. In many performance venues, only those who sit in balconies can see much of the orchestra in the pit, because a pit orchestra is not meant to be the center of attention. That orchestra is in place to augment, supplement, and set the mood for the action on the stage; likewise, worship musicians are there to augment, supplement, and set the mood for worship. They are not there to be worshiped, nor to attract attention to themselves, but to make it possible for the congregation to worship. If the worship team — whether an acoustic combo, a power band, or a full orchestra — were below congregants’ line-of-sight, rather than between the congregation and the cross or between the people and the altar, would it help the people worship better? Maybe not: maybe people want the spectacle; maybe they want to be entertained. But it would remind the musicians that they are not there to be the center of attention. They are there to serve the Lord and the congregation — it is a worship service, after all — and not just a chance to show off their musical chops. There just might be an even better arrangement than either choir lofts or orchestra pits. I’ve never seen this tried anywhere, but what if church was conducted “in the round,” so to speak, with the worship musicians gathered in the center of the worship space and the congregation ranged around them. 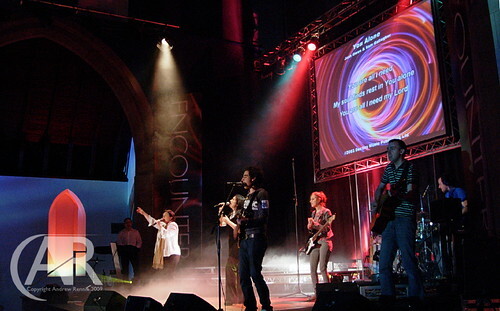 Instead of being on risers or on stage, singers could be spaced out among the congregation to help the people sing (which seems infinitely preferable to those worship teams in which soloists sing almost all of the songs, such that the congregation seems unsure if they should be singing or not). In this arrangement, the musicians and singers in the worship team would be worshipers along with the congregation, inviting the rest of the attendees to sing along because they are close to the music, almost part of it themselves. Maybe that wouldn’t work — maybe the sound would be too uncontrolled, too inconsistent. Maybe it would work. But maybe what really matters is paying attention to the fact that it’s a worship service, not a concert. Which brings me back to the question posed above: how might worship be different at The Gift Church? Worship. The Church shall present worship opportunities that emphasize reverence for God’s holiness, majesty, and power, and gratitude for God’s presence, protection, and salvation. Worship services shall respect but not be bound by Christian traditions and, when practical, shall incorporate elements of prayer (Philippians 4:6), music (Colossians 3:16), teaching and exhortation (1 Timothy 4:13), and fellowship (Hebrews 10:23-5). Worship leaders shall, to the best of their abilities, focus attention on God rather than on themselves or the congregation. The worship environment shall, to the extent possible, be designed, built, and/or arranged to minimize distractions and to concentrate attention on the object of worship, i.e., the Lord Jesus Christ, more than on worship leaders. The Elders and others responsible for planning and presenting worship shall develop a rotating calendar of worship services, suited to the needs of the congregation and the community, to celebrate all major Christian holy days and such additional festivals and holy days as they may see fit. Most of that I wrote last year, because I wanted to emphasize that The Gift Church would not be a church built to entertain itself — and certainly not to indulge itself. Worship would be an important element of The Gift Church, but the church would not exist just to provide a space for worship. The church would exist to serve: purposed to spread the Gospel not by just talking about it — “God bless you, go in peace,” as Keith Green sang, “while all Heaven just weeps” — but by living the Gospel, denying itself and taking up the cross and channeling its contributions to the needy. As I’ve noted in earlier installments, maybe a church with that purpose wouldn’t survive for very long. But it might make a difference while it lasted. Anyway, I just added the line about the worship environment last week, when I started thinking about choir lofts and orchestra pits. What about you? When do you feel the most engaged in worship? Would a different worship environment, or worship approach, help you feel closer to God? Do you want to be invited to participate in worship, to take an active part in the praise to the extent you feel comfortable? Or do you want to be sung to, talked to … entertained? And if you are a worship leader, what are you doing to keep the attention off yourself and on the Lord? Or am I the only one who cares about these things? Tagged church, music, worship. Bookmark the permalink. One Response to The Gift Church: Choir Loft, or Orchestra Pit?